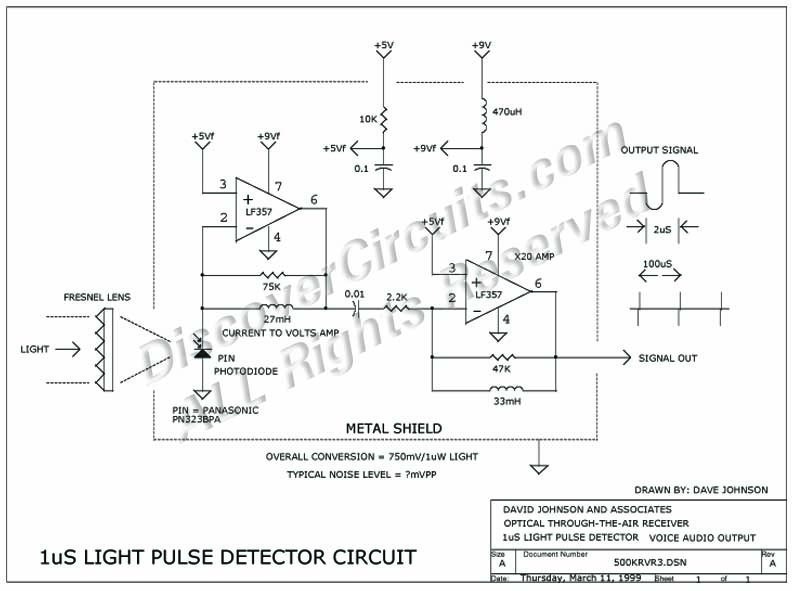 Circuit: 1uS LIGHT PULSE RECEIVER PLUS POST AMP__ Circuit designed by David A. Johnson, P.E. This circuit is designed to detect very weak light pulses lasting 1uS. It uses a tuned LC feedback network to provide high sensitivity while giving high ambient light immunity. A post voltage Amplifier is included with a gain of about X20. The circuit is described in more detail in the receiver section of my Handbook of Optical Through the Air Communications. Note: The LF357 op Amp is no longer available, this circuit is for reference only.